After a bit of searching online you’ll soon learn that this passenger boat service to Koh Kood has three names. 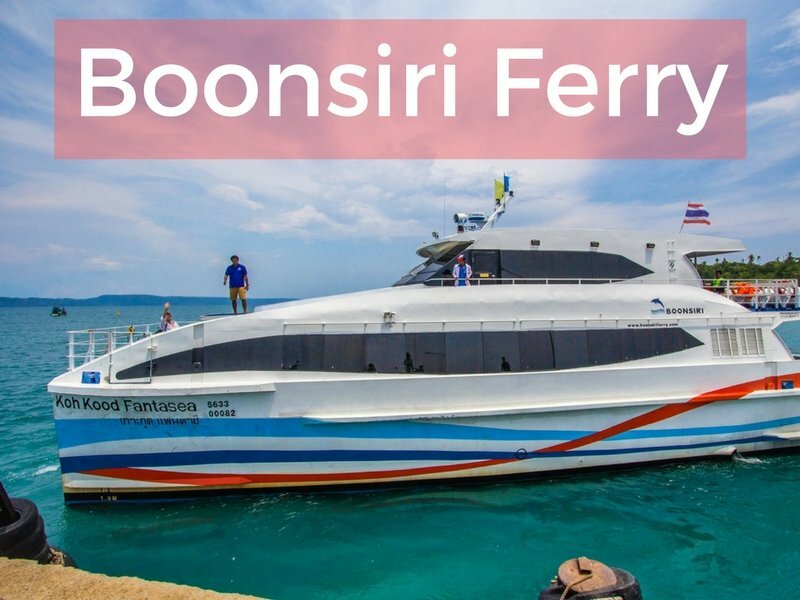 This arises from the fact that the Boonsiri Ferry company run a catamaran and the vessel’s name is the ‘Koh Kood Fantasea’. Boonsiri Ferry began services in 2015 and in October 2018 added a second, lager vessel to their fleet. The new 288 seat, catamaran ferry has three decks, the top deck being a VIP room, and is equipped with a modern state of the art computerized stabilizer and is fully compliant with International Safety Standards. There are two services a day during High Season between the mainland pier in Laem Sok and Ao Salat pier in the northeast of Koh Kood. In the Low Season there is one ferry running in each direction. During the High Season, the boats also stop at Koh Mak and Koh Chang. 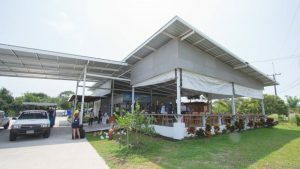 This allows anyone who wants to island hop between Koh Kood, Koh Mak and Koh Chang to do so in air conditioned comfort, rather than by speedboat. NEW! Koh Chang to Koh Mak & Koh Kood Ferry Service. Starting October 2018, and with the introduction of the second boat, it will be possible to take the Boonsiri Ferry from Bangbao pier, Koh Chang to Koh Mak or Koh Kood. This is a great alternative for people who prefer a more comfortable ride than the current speedboat services provide. Please note that during Low Season the inter island boats don’t run. Only the mainland to Koh Kood service is operational. Starting on 1 November 2018, passengers flying into Trat Airport on flight PG301 or PG305 will be able to book a combined bus and boat ticket for Boonsiri Ferry. The ticket price will be 700 Baht to Koh Mak and 800 Baht to Koh Kood. Likewise for the return trip, passengers departing Trat on PG306, PG308 or PG310 will be able to buy a ticket for the catamaran plus taxi service from Koh Kood to the airport. The ticket price is the same – 800 Baht per person. 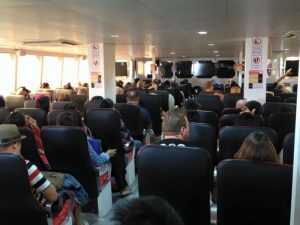 How to Book Tickets for Boonsiri Ferry to Koh Kood? – Children under 3 years old travel free of charge. – Children from 4 to 9 years old pay 50% of the Adult fare. Over 10 years old pay full price. – Luggage in excess of 30Kg, is charged at 20 Baht per Kilo, up to a maximum of 50Kg total. The service runs year round, although towards the end of Low Season, usually in late September, the boat will be out of the water for a couple of weeks for its annual maintenance. Originally called the Boonsiri ‘Fantasea’, the first vessel entered service in November 2013 and quickly proved to be the fastest and most comfortable way to get to Koh Kood. This is due to to it’s is state of the art computerized stabilizer aluminium, catamaran hull, it’s relatively light yet very stable in choppy seas. In good weather, the catamaran can cruise at 25 Knots and the journey takes around an hour and 15 minutes. Which is pretty quick for a vessel that can accommodate 200 passengers plus luggage. The ship has two decks, the lower deck can seat 150 passengers, whilst the upper deck, which also has some outdoor seating, provide seating for 50 more. The interior spaces are nice and cool with tinted windows and reclining seats. Passengers will also find a small shop selling snacks and drinks plus big screen TVs and free wi-fi onboard. In 2018 the original boat was replaced with a new, larger boat of a similar style. This can carry more passengers and is faster and more efficient. The old boat is now used on the Koh Chang – Koh Mak – Koh kood route which runs during the high season. For passengers staying in Trat, a shuttle service by ‘songtaew’ ( local pick up truck taxi ) is provided. This costs 38 Baht per person and is not included in the price of the boat ticket. You pay the driver. If you buy boat tickets from your hotel, they’ll advise you of the time. Or if you’re booking online, make sure you let the agent or boat company know the name of your hotel and they’ll confirm the details. Many people opt to take a public bus from Bangkok to Trat, stay the night and see a little of Trat town, and then head to Koh kood the next morning. But if you want to do the trip the same day then it’s a bit of a hassle by public transport. Firstly, it is easy to arrange a private transfer by car or minivan from Suvarnabhumi Airport or a hotel in Bangkok to the mainland pier. This can be done on through well known sites such as iamkohchang.com. Note that if you are staying in a hotel in Bangkok, you’ll need to leave before 08:00 to be sure of catching the last boat of the day at 14:20. 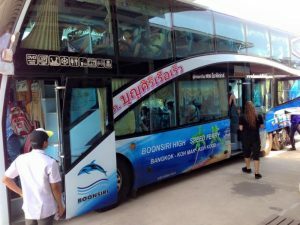 Alternatively, if you want to keep costs down, Boonsiri run their own bus service between Khao San Rd, Bangkok and Laem Sok pier. As this is run specifically for their passengers, you’re guaranteed not to miss the boat. The Boonsiri bus is either a double decker bus or a minibus, depending on the season and the demand. The service also runs in reverse, from Laem Sok to Bangkok, and for passengers heading to Suvarnabhumi Airport, the bus will drop off at Latkrabang airport link train station. Passengers can take the overhead train for the 10 minute journey to the airport. Finally, for anyone bringing their own car, there’s secure, covered parking available at the Boonsiri office in Laem Sok. This is 50 Baht per night. Hello! Can we take 2 bicycles on the ferry to Koh Mak? Yes. You can take them on the Catamaran. Hi, we need to go from koh Chang to Koh mak. Does this ferry go that distance now in mars? Do we book The tickets here on website? Hello. At the beginning of May 2019, will your boats from Koh Chang to Koh Kood and Ko Mak and back? Or just from the mainland to plan? 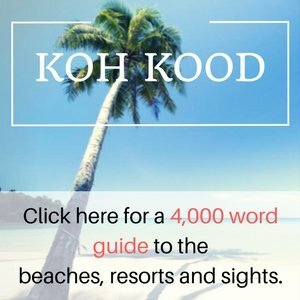 Where to buy at Koh Chang? Need to book in advance? Thank. 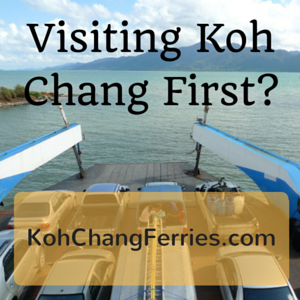 Originally Boonsiri ferry announced they would run the Koh Chang – Koh Mak – Koh kood service during the low season. However, now they won’t. The boats will only go from Laem Sok to Koh Kood. With no stop at Koh Mak. unfortunatly I have just find 2H15 mn trip…. is there a possibility to go directly from kho mak to laem sok pier? There’s only one boat from Koh Mak to Laem Sok. It is slow because it picks up on the way to Koh Kood and then you go back from Koh Kood to the mainland. It is much quicker to take one of the speedboats from Koh Mak to the mainland pier at Laem Ngop. Then it’s about 40 minutes drive by taxi to Laem Sok. Hello! I would like to book a ticket on your boat on 22-23 (I don’t know when exactly). The problem is i cannot book it through 12goasia website. Is there another possibility to buy a ticket? Koh Kut Princess can take a couple of scooters on the boat. But only locals sometimes take their bikes on the boat. You can rent scooters when you are on Koh Kood. 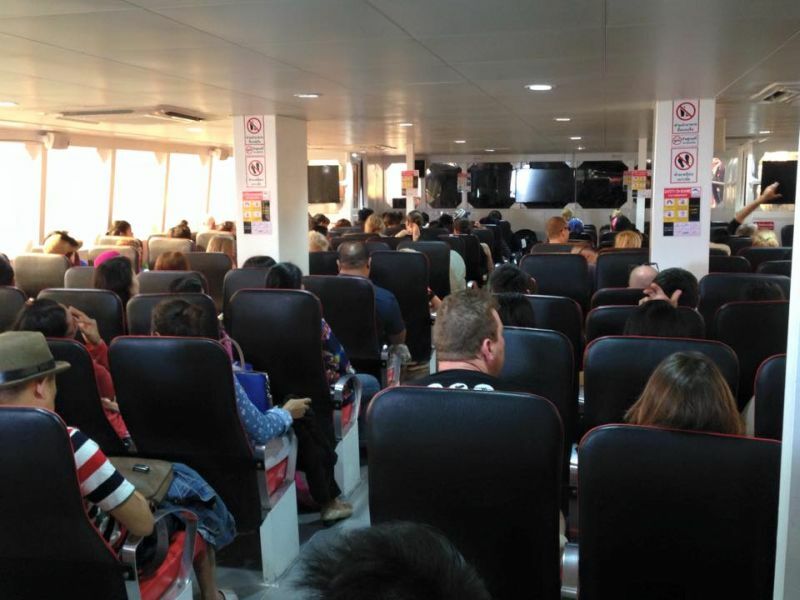 The Boonsiri Ferry will start running later in October.